After I downloaded the new version of Joost Beta today – 0.8.1. – everything seems to be the same. I was disappointed that I still couldn’t find any MTV (USA) content. The redesign, among other things, includes an area with “approved” screenshots to use in blogs. I assume the Joost team caught on to the fact that everyone is posting their own. 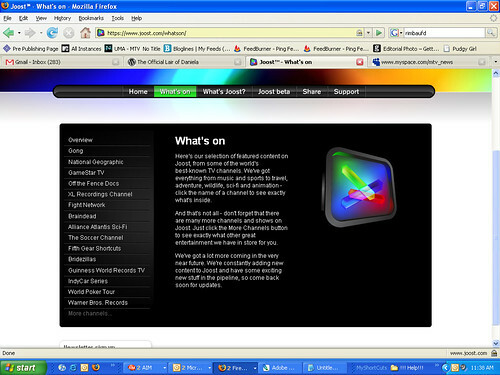 It probably wouldn’t have hurt them to include screenshots of the website makeover as well. 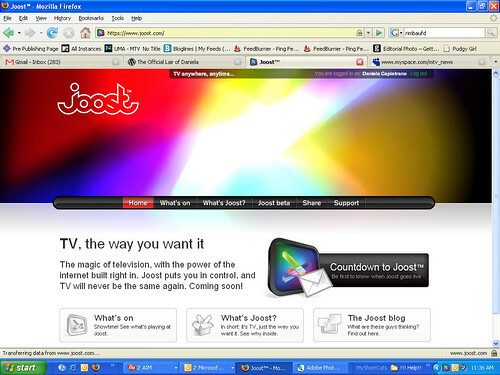 There is also a “What’s Joost” section where there is a video explaining what Joost is about, as well as an official list of available programming. Again, it lists MTV and BET but when I search for both I get nothing. The Joost “Coming Soon” area teases to more upcoming community features, and a Joost developer kit that will allow you to create your own widgets and share them with the community. … I wonder if Joost plans on partnering with Play Station Home. If they don’t, someone else will.